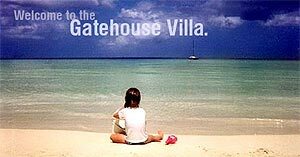 Welcome to Gatehouse Villa. Negril's Gatehouse villa is located right smack in the middle of Negril Jamaica's spectacular 7-mile white sand beach, and is walking distance to ALL the sizzling nightlife on the town. 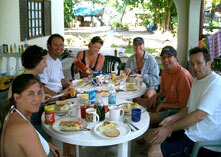 The two best things about the Gatehouse are its location and staff. 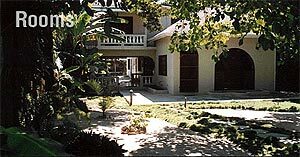 Directly on the beach, just a few feet away from the water, the Gatehouse's quiet location is near the middle of Negril's seven mile white sand beach. That means that restaurants, bars, music venues and other activities are all just a short walk away. All of Jamaica's finest activities are nearby, including; scuba diving, snorkeling, golf, tennis, and of course, simply relaxing. In the mood for a private party of any size? 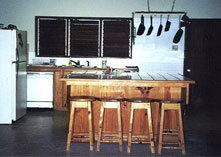 Ask Tony about his famous Jerk Chicken and Grilled Lobster barbecue parties right on the property next to the bar. 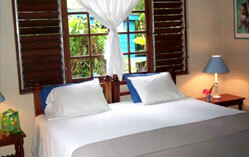 The Gatehouse is comprised of four very large bedrooms, each with their own entrance, shower and bathroom. We also have a fully equipped kitchen that can be used when renting the entire villa or the apartment which includes the downstairs suite, kitchen and front room. 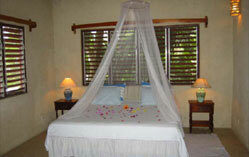 My favorite room, this is our ocean view room on the ground floor. It has a ceiling fan, bathtub/shower and is just steps away from the water, with a beautiful view through our arched window. 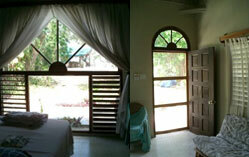 This suite offers a king-size bed, air conditioning, a ceiling fan, walk in closet, and shower. Adding an extra bed is never a problem. This quiet room has air conditioning, a small refrigerator, a ceiling fan and is very large so adding an extra bed is no problem. 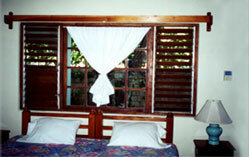 to enjoy Negril's sun, fun in Jamaica.